The SWAMP project actively participated in the collocated events IoT Week 2018 and the Global IoT Summit 2018 (GIoTS’18), held in Bilbao, Spain during June 4th and 7th 2018. The participation of SWAMP was in three different moments. 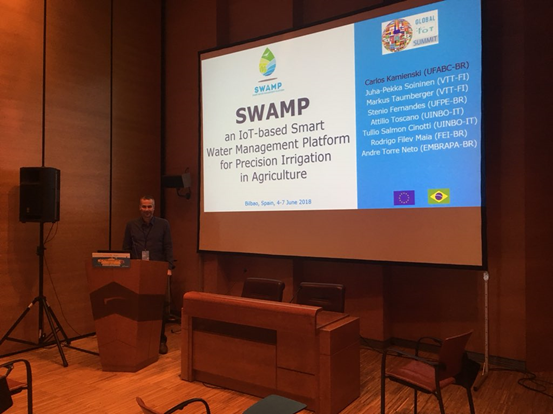 Firstly, the paper “SWAMP: an IoT-based Smart Water Management Platform for Precision Irrigation in Agriculture” was presented in the GIoTS’18 session IoT Applications, Services I at June 5th. 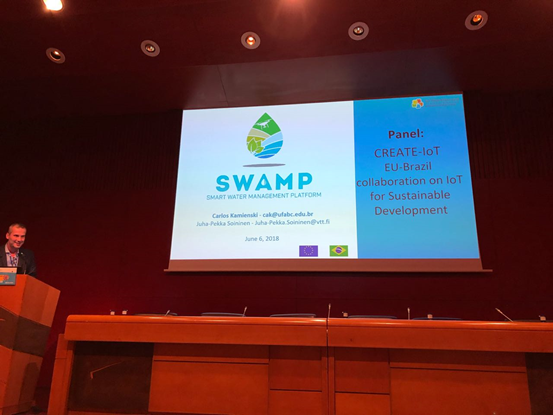 Secondly, SWAMP participated in the panel CREATE-IoT EU-Brazil collaboration on IoT for Sustainable Development, aimed at presenting the 3 new EU-Brazil IoT Pilots’ projects (OCARIoT, SWAMP, FASTEN) and discussing research/development/piloting approaches, difficulties and collaborations (between the 3 projects, with the EU IoT LSP initiative). Thirdly, the Brazilian IoT Forum had a stand as an exhibitor at the IoT Week 2018, where a TV continuously displayed a video that represented the activities of different members of the Brazilian IoT community at this event. A SWAMP slideshow was added to this video and therefore was played during the whole event.